emanuel committed rW0da8f8db9cee: Updated compendium versions. (authored by emanuel). emanuel committed rWf1958d912098: Web: Updated GnuPG and GPA version. (authored by emanuel). Web: Updated GnuPG and GPA version. emanuel committed rW74be307a09f2: Merge branch 'website' of git+ssh://playfair.gnupg.org/git/gpg4win into website (authored by emanuel). emanuel committed rW59cfe6aa10b1: Use new 'next steps' section in thanks pages. (authored by emanuel). Use new 'next steps' section in thanks pages. emanuel committed rW93e183754492: Updated .gitignore. (authored by emanuel). emanuel committed rW5be42c9a6d7c: Fixed layout of package-integrity page. (authored by emanuel). Fixed layout of package-integrity page. 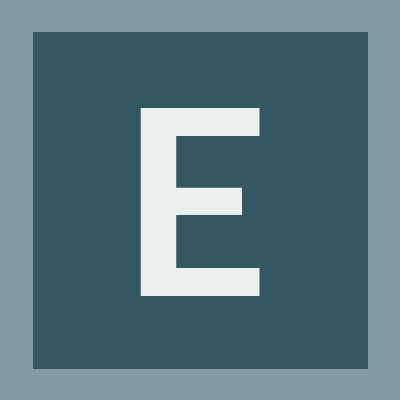 emanuel committed rW9791f2f5d88b: Fixed typos in NEWS and README.de.txt. (authored by emanuel). Fixed typos in NEWS and README.de.txt. emanuel committed rW92933d7bd500: Prepare 3.0.0 release. (authored by emanuel). emanuel committed rW516dbad24b71: Updated version3 page (authored by emanuel). emanuel committed rWbbb5b9520950: Merge branch 'website-3-dev' of git+ssh://playfair.gnupg.org/git/gpg4win into… (authored by emanuel). emanuel committed rW68c44a560729: Updated version3 page. (authored by emanuel). emanuel committed rW934028d67088: Update German translation for slideshow. (authored by emanuel). Update German translation for slideshow. emanuel added a comment to T3050: Upload wizard. Right. Now I see the wks page in advanced setup. In basic setup there is only a minimal wks info page. WKS confirmation email is send in both cases. Good. @kai Can you please check the current state in upstream. Thanks. @kai Can you say when your patch will be upstream? We wait for a public nightly build of enigmail with all your wkd/wks changes. emanuel added a comment to T3234: Highlighting certificates that are compliant on key selection for encryption. We need a more prominent visualisation for compliant keys in key selection dialog of Kleopatra. E.g. as icon. emanuel added projects to T2211: Wish: List all started services by gpg4win on the wiki page: gpg4win, Feature Request, Documentation. emanuel added projects to T2174: Adding a free-form note tab to cert listing in Kleopatra: gpg4win, Feature Request, kleopatra. emanuel added projects to T2173: Change hash algorithms in GUI: gpg4win, Feature Request. emanuel added projects to T2172: Add version number to gpg.exe: gpg4win, Bug Report. emanuel added projects to T2171: ASLR and DEP not enable in EXE and DLL's: gpg4win, Feature Request. emanuel updated subscribers of T2171: ASLR and DEP not enable in EXE and DLL's. emanuel updated subscribers of T2170: Secure delete option for decrypted file. emanuel added projects to T2170: Secure delete option for decrypted file: gpg4win, Feature Request, gpgex. emanuel added projects to T2146: Gpg4win does not kill all gpg-agents on update: gpg4win, Bug Report. emanuel updated subscribers of T2146: Gpg4win does not kill all gpg-agents on update. emanuel updated subscribers of T2140: GpgOL should always send SENDER with actual sender email. emanuel added projects to T2140: GpgOL should always send SENDER with actual sender email: gpgol, Bug Report. emanuel changed Version from 1.1.1 to 1.3.0 on T1247: Umlauts problem in German GpgOL menu. emanuel added a comment to T1247: Umlauts problem in German GpgOL menu. emanuel closed T2131: GpgOL 1.3.0-beta59 creats copy of crypto mail in OL2003 as Resolved. emanuel added a comment to T2131: GpgOL 1.3.0-beta59 creats copy of crypto mail in OL2003. menu (in German: "Gelöschte Nachrichten permanent löschen"), see . So not a GpgOL bug. => Resolved. emanuel added projects to T2132: Missing blue encryption successfully line for InlinePGP-meessages in GpgOL 1.3.0-beta: gpg4win, gpgol, Bug Report. emanuel updated subscribers of T2132: Missing blue encryption successfully line for InlinePGP-meessages in GpgOL 1.3.0-beta. emanuel updated subscribers of T2131: GpgOL 1.3.0-beta59 creats copy of crypto mail in OL2003. 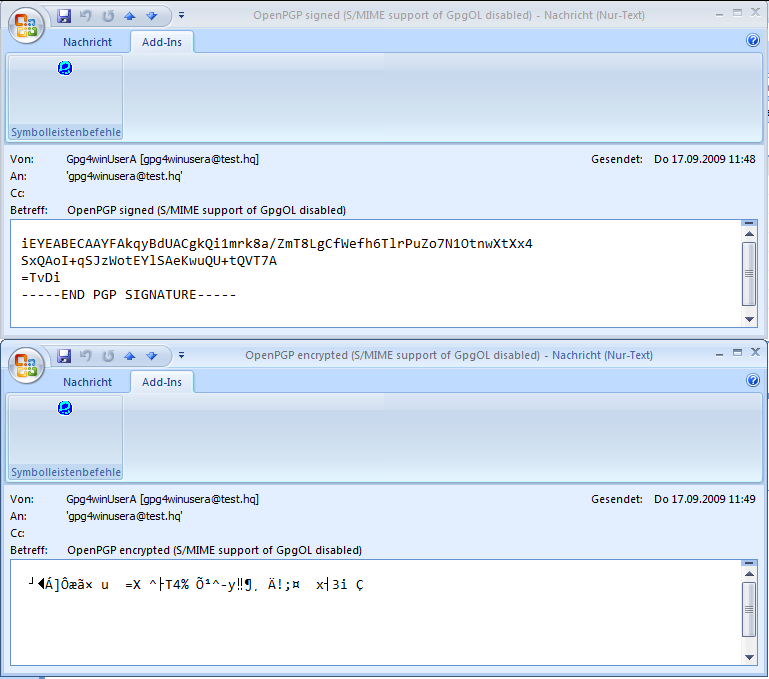 emanuel added projects to T2131: GpgOL 1.3.0-beta59 creats copy of crypto mail in OL2003: gpg4win, gpgol, Bug Report. emanuel added a comment to T1932: GnuPG 2.1 (gpgsm):set default of 'hash-algo' from sha1 to sha256. Is there a need to backport it to 2.0 ? emanuel updated subscribers of T1932: GnuPG 2.1 (gpgsm):set default of 'hash-algo' from sha1 to sha256. emanuel added projects to T1932: GnuPG 2.1 (gpgsm):set default of 'hash-algo' from sha1 to sha256: S/MIME, gnupg (gpg21), gnupg, Bug Report. emanuel added a comment to T1324: Encryption of an folder with umlauts failed. emanuel closed T1324: Encryption of an folder with umlauts failed as Resolved. emanuel closed T1237: The pinentry button "Cancel" should renamed to "Abbrechen" if German as language is used. (rt#5946) as Resolved. emanuel removed a project from T1237: The pinentry button "Cancel" should renamed to "Abbrechen" if German as language is used. (rt#5946): Testing. emanuel added a comment to T1237: The pinentry button "Cancel" should renamed to "Abbrechen" if German as language is used. (rt#5946). emanuel updated subscribers of T1324: Encryption of an folder with umlauts failed. emanuel added projects to T1324: Encryption of an folder with umlauts failed: Windows, gpg4win, gpgex, Windows 32, Bug Report. emanuel added a project to T1102: Sending enc/signed mails does not work with Exchange: gpg4win. emanuel changed Version from 2.0.1 to 1.1.1 on T1102: Sending enc/signed mails does not work with Exchange. emanuel added a comment to T1102: Sending enc/signed mails does not work with Exchange. I tested with gnupg 2.0.16 + pinentry 0.8.0-svn234. You say that I should test gnupg 2.0.16 + pinentry 0.8.0-svn237. emanuel closed T1285: gpgconf doesn't restart gpg-agent after running gpgconf with '--change-option --runtime' as Resolved. emanuel removed a project from T1285: gpgconf doesn't restart gpg-agent after running gpgconf with '--change-option --runtime': Testing. emanuel added a comment to T1285: gpgconf doesn't restart gpg-agent after running gpgconf with '--change-option --runtime'. Fix confirmed. Tested with gpg4win 2.1.0-svn1569. emanuel updated subscribers of T1286: gpg-agent doesn't work if started with "eval $(gpg-agent --daemon)". emanuel assigned T1286: gpg-agent doesn't work if started with "eval $(gpg-agent --daemon)" to werner. There seems to be a relation if gpg-agent.conf exists or not. are required for show the german "Abbrechen" button text in pinentry-qt? emanuel added a project to T1010: Cache file rename problem under W32: gpg4win. emanuel added a comment to T1010: Cache file rename problem under W32. ping, it's important for gpg4win. emanuel added projects to T1285: gpgconf doesn't restart gpg-agent after running gpgconf with '--change-option --runtime': gpgagent, gnupg, Bug Report. emanuel set Version to 2.0.16 on T1285: gpgconf doesn't restart gpg-agent after running gpgconf with '--change-option --runtime'. emanuel updated subscribers of T1285: gpgconf doesn't restart gpg-agent after running gpgconf with '--change-option --runtime'. emanuel raised the priority of T1237: The pinentry button "Cancel" should renamed to "Abbrechen" if German as language is used. (rt#5946) from Wishlist to Normal. emanuel added projects to T1237: The pinentry button "Cancel" should renamed to "Abbrechen" if German as language is used. (rt#5946): i18n, Bug Report. emanuel removed a project from T1237: The pinentry button "Cancel" should renamed to "Abbrechen" if German as language is used. (rt#5946): Feature Request. Werner, please note: this issue is kkc. emanuel assigned T1237: The pinentry button "Cancel" should renamed to "Abbrechen" if German as language is used. (rt#5946) to werner. emanuel updated subscribers of T1237: The pinentry button "Cancel" should renamed to "Abbrechen" if German as language is used. (rt#5946). emanuel changed Version from 0.8.0.svn231-0kk2 to 0.8.0.svn234-0kk1 on T1237: The pinentry button "Cancel" should renamed to "Abbrechen" if German as language is used. (rt#5946). emanuel renamed T1237: The pinentry button "Cancel" should renamed to "Abbrechen" if German as language is used. (rt#5946) from The pinentry button "Cancel" should renamed to "Abbrechen" if German as language is used. to The pinentry button "Cancel" should renamed to "Abbrechen" if German as language is used. (rt#5946). emanuel added a comment to T1110: Outlook2007 crashes after opening attachments of an encrypted message. after double clicking the txt attachment. Gpgol log file attached. emanuel added a comment to T1259: pinentry should show fingerprint if certify a OpenPGP certificate. pinentry if you enabled allow-mark-trusted option for S/MIME). emanuel renamed T1259: pinentry should show fingerprint if certify a OpenPGP certificate from pinentry should show fingerprint if certify a certificate to pinentry should show fingerprint if certify a OpenPGP certificate. emanuel changed Version from 1.1.1 to 1.1.2 on T1110: Outlook2007 crashes after opening attachments of an encrypted message. emanuel updated subscribers of T1259: pinentry should show fingerprint if certify a OpenPGP certificate. emanuel added projects to T1259: pinentry should show fingerprint if certify a OpenPGP certificate: Feature Request, pinentry. emanuel added projects to T1247: Umlauts problem in German GpgOL menu: gpgol, Bug Report. emanuel updated subscribers of T1247: Umlauts problem in German GpgOL menu. emanuel set Version to 1.1.1 on T1247: Umlauts problem in German GpgOL menu. Same problem for both emails: OL2007 crashes after opening an attachment. emanuel changed Version from 1.0.0 to 1.1.1 on T1110: Outlook2007 crashes after opening attachments of an encrypted message. Still the same problem with gpg4win 2.0.2 (aka GpgOL 1.1.1). emanuel added a comment to T1137: GpgOL could not decrypt/verify messages in "sent items" folder if smime support is disabled. ok, please enable s/mime support by default for next release. emanuel added a comment to T1130: GpgOL: can't open encrypted emails in "Sent" Folder. sorry, jroemmler, I have mixed the issue numbers. 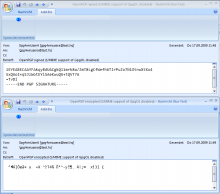 decrypt/verify messages in "sent items" folder if sime support is disabled). emanuel assigned T1130: GpgOL: can't open encrypted emails in "Sent" Folder to jroemmler. Seems to be the same issue like T1110, right? emanuel set Version to 1.0.1-svn308 on T1137: GpgOL could not decrypt/verify messages in "sent items" folder if smime support is disabled. emanuel updated subscribers of T1137: GpgOL could not decrypt/verify messages in "sent items" folder if smime support is disabled. emanuel added projects to T1137: GpgOL could not decrypt/verify messages in "sent items" folder if smime support is disabled: gpg4win, gpgol, Bug Report.